The United Nations was set today to appoint an obscure Malaysian astrophysicist to act as Earth’s first contact for any aliens that may come visiting. Bobbo, why China? It has the most people but the aliens can’t see national boundaries. India has about the same population with 1/3 the are, so it is more dense. Bangladesh even more so. Or perhaps they will go to Japan or New York based on the night lights. Shouldn’t the proper pick have been Al Gore? 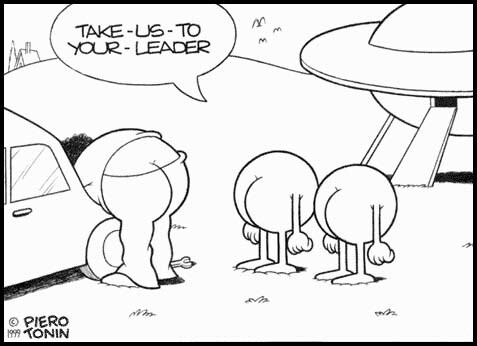 UN denies alien ambassador plan. The United Nations has dismissed media reports that it is planning to appoint an ambassador to be the first point of contact with aliens. Britain’s Sunday Times had reported that a UN official had been given the task of co-ordinating humanity’s response if extraterrestrials make contact. However, the official in question, Malaysian astrophysicist Mazlan Othman, says that while she likes the idea of being an alien ambassador, the job does not exist. Wow! Anybody else experience “lost time” reading this thread? Bad Behavior has blocked 13515 access attempts in the last 7 days.